Over the past few years in Kochi, the successful launch of the smart serve facilities management program has helped to meet the ends for quality house keeping services with the growing demand for domestic cleaning services in Ernakulam. Men & women in good numbers have enrolled themselves with Smart Serve for employment, serving hundreds of homes and offices in and around Cochin. The need for quality facilities management is new for a city like Cochin or Trivandrum as these cities are entering the process of rapid change. The growth in the IT and Banking sector has given rise to major investment projects in the city, inviting its doors to thousands of migrant workforce from all over India. And as the city grows in its full pace, changes in lifestyle is highly notable towards a cozier and comfortable one. The practice of hiring professional cleaning services in Cochin is newly formed when compared to cities like Mumbai or Bangalore. And yet the city of Ernakulam shows its acceptance of new and improved way of life for itself. The impact of facilities and property management are manifold. 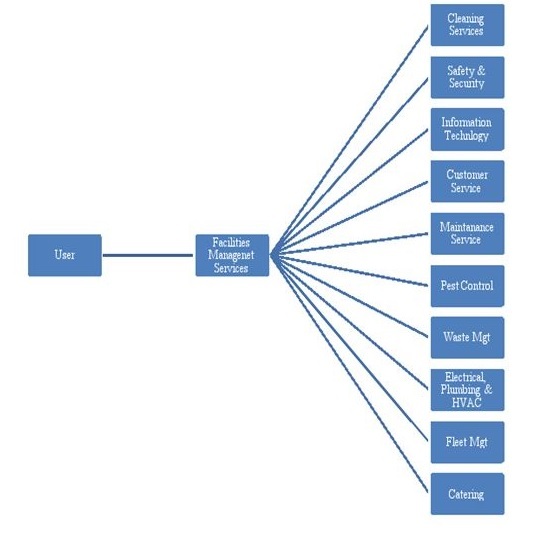 A glimpse of the range of services and facilities available through effective facilities management can be understood from the diagram below. Now, the city of Cochin has its favorite team of domestic cleaning services which makes life in Kochi, a pleasant and enjoyable one. The women certainly appreciate the ease in work stress and the family man, finally has peace. The idea of affordable domestic cleaning services in Ernakulam and the prospect of saving time, energy and money on cleaning works has got the city up and running towards a more comfortable lifestyle.